Someone asked me what I look for in a stunt people when casting for our films. I gave him more than an ear-full, which may have been unwarranted but made me realize it could make an interesting post, because the answers weren’t as broad as some would think. If I’m doing a kick to the head, and his block comes up too early (usually because he’s just drilled the moves of the fight into a choreographed move set, like a kata) then the audience sees my kick coming too soon. So he’s telegraphed my kick, and I look slower. Telegraphing a move itself means making it obvious to the audience that a move (i.e. a kick) is coming. If a telegraphed kick manages to hit me, then I’m slower than the audience. Subconsciously they’ll think they’re better, and they’re technically right. Not good. Study pro boxing matches for good examples of how professionals avoid telegraphing their moves. I say “Move Speed” because 20 weak punches thrown rapidly in the span of 8 seconds looks worse than 10 fast, crisp moves thrown in the same time period. Martial artists of any caliber often have a problem doing a move at 100% speed on camera and they end up slowing down to “sparring” speed. I have no idea why this is, but it’s annoying and I avoid stunt guys who have that issue. If they can do 10 crisp moves at 100% speed, then it’s just a matter of muscle memory to get that up to 20 moves. This requires less effort than trying to teach them how to do their moves better. I leave that part to martial art instructors, which I am not. Because they will bruise after we clash limbs at the same spot 60 times. When a stuntman is “waiting” in the middle of a fight, a number of annoying things sometimes happen. Glare– Stuntman opens his eyes wide and puts his chin out while he waits for hit to connect, signaling to the audience that a hit is coming and reducing the impact. His mouth might make an “o” shape too. Flaily Arms – Stuntman moves his arms wildly like windmills. It cheapens the movement on camera, since no meaningful sound could be derived from flaily arms. The problem with this is that stuntmen look at their own flaily arms and think they’ve done a great job at keeping the action moving, but a director sees it as cheapening the value of the fight as a whole. The problem can be alleviated with choreography that fills more space, but I take the view that stunt guys are better off just reducing their movement. Twitching – Stuntman is ready to block a move too soon, but instead of telegraphing, stuntman raises his arms to blocking position rapidly multiple times until the attack comes. Same result as flaily arms but more linear (fills fight with less flow-y nonsense and more jittery nonsense, if that makes sense…). Stuntman can kick a block at 100% power without blasting through it and breaking the actor’s arm or, if the actor fails to block at all, his head. Martial artists are taught to punch past the block, or chop past the board. That’s all good for breaking wood and bones. Not good for film. The contact line is the spot you have to hit so it looks like you smacked the actor, without actually smacking him. Draw a line from the camera lens to the actor’s face, and extend to infinity past his face. Pretend that line is a super-tight bungee cord and hit it accordingly. Wide angle lenses will make it harder to hit the line, but your move will be faster. If the camera is constantly moving and the contact line changes, keep imagining the line moving around so you don’t miss it at the end of a long shot. Hit the line and don’t slip too far past it. This one’s critical. AMM is the ability to quickly modify what you’ve learned your entire life, adapt it for the camera, and work it into a fast series of moves. Most people can’t remember a series of 20 moves, let alone 1 very new & weird thing in that series. It requires the kind of muscle memory that is able to flush itself dry within one minute and remember an entirely new move like it’s something you’ve known your entire life, while still remembering everything else in the choreography. After practicing the choreography, the move stops feeling weird and become a natural reaction whatever the other person is doing. Within 20 minutes, you’ll forget it entirely so you can “free up parking spots” for the next moves. You’d think dancers would be better at this, but I’ve noticed no correlation. My cursory understanding is that dancing is more like flow. Fighting is reaction. While dancers do react to music or other dancers, it’s a slow reaction that builds on itself and targets a different part of the brain. Fight choreography is mostly reaction with 10% flow just to make sure the next move comes. A fight that flows too much becomes dance and stops being fight, so dancing skills are not very transferable. That’s not to say dancers can’t have this, but the skills don’t overlap much. AMM is just rare. I’ve never been a fan of everyone knowing the same moves, and The Stunt People have a wide variety of styles. Fights are more interesting when the audience can see new things, evidenced by audience excitement when a unique fighter enters the MMA circuit. I like when a stunt person has something unique to offer. It gives me as a choreographer something to play with and inspires the rest of the team. Aside from that, the usual: good martial arts, good falls (if applicable), not injury-prone, able to work 20+ hours, takes direction, can think on the spot, etc. What are your picks for best action scenes of 2011? Jackie Chan was recently featured in an interview while launching his Maotai Wine, and revealed that shooting of Chinese Zodiac – described as his last action-packed film – is about to wrap while a scene involving lots of stunts is to be initiated which will take an amount of two months to shoot and with footage lasting 4 minutes in total on film. That means a HECK LOT of hard work and risks being taken for Jackie’s part! He will also include his trademark outtakes during the end credits. Sounds like someone is ought to make the best of what he has got left in him. Respect to Jackie! Donnie Yen and his stunt team are currently prepping the fight choreography for the upcoming action thriller Special Identity seen on the image. The best thing about it is that Donnie’s good old friend and once on-screen rival John Salvitti – who you might remember from In the Line Of Duty 4 as the assassin on motor bike who fights Donnie wearing weird sunglasses and making bizarre Bruce Lee noises, and Tiger Cage 2 playing the sword-wielding henchman with the pony-tail hair – is involved in the project and will be one of the action choreographers for Donnie. Many may not know this but Salvitti has been a big influence for Donnie ever since the latter began choreographing his own films and experimenting as well as implementing different combat styles on-screen. When it comes to grappling and the like, Salvitti was the one who inspired Donnie to introduce these techniques to Hong Kong action films which has since become a habit of his. Productions such as the German-produced Codename: Puma, Blade 2, The Twins Effect, Stormbreaker and last but not least Flash Point has Salvitti finger-printed in one or several ways as he in fact was involved in them. Whatever Donnie, Salvitti and the stunt team will come up with, I’ll highly anticipate the outcome as Donnie has yet to disappoint in terms of variety and fresh ideas. With Salvitti onboard though, things are getting more interesting. Check out videos of Salvitti in action both in front of and behind the camera below. Recently I posted about story structure. Typically, the entire story has 40 or so scenes, each one with a beginning and end. What to do with the stuff in between? That’s where more structure comes in, and you can literally use the same structure to figure out the beats of a scene. This way, there’s an emotional change in every scene, which keeps us glued to our seats. Fight scenes fall into the same category. A well-structured fight scene keeps the pace going, instills drama, and drives the story. I’ve got a rough template for when I script my own fight scenes. Please steal it, or if you can improve upon it email it to me so I can steal it back. Note that if the fight is just a small bit in the story, or a little line of text in a script, character growth may not be necessary and this structure won’t apply. Problem – Show the problem faced by the protagonist. Secondary dangers are a plus. Environmental danger, other exterior motivations to win, etc. Theme – Demonstrate the problem in more detail. Villain gets to show off. Reality check – Problem is “brought home” in some way. Some non-debilitating injury for the hero, etc. Similar to first answer. This might involve a different element altogether, like an environmental variable. Tie it up – pull the rabbit out of the hat. Make it interesting. The more human the better. If this is the finale, pull something from early in the film to wrap the entire film up in one move. There are a million different ways to do a fight scene, but this is about as general as I can make it while still sticking to the standard story structure. JJ Perry has been all over the stunt industry. From doing stunts as Sub Zero in the Mortal Kombat film to fight choreography in Haywire, his credentials speak for themselves. Here are some interviews where he basically reiterates the Action Kickback Model, that audiences today are smarter about martial arts than just 10 years ago and it’s time to fill the demand. It became less about how how things worked, as far as martial arts go, but more about how they looked. Because in the movies it doesn’t matter how it really works, it only matters how it looks. We’re working on something called gun-jitsu, which is like jujitsu but with guns. Because I have a feeling that we have so many sergicemen coming home now, and so many stories of what they’ve done in Afghanistan and Iraq will become declassified and will become movies. … Jujitsu has become so prominent now because MMA is so prominant now, that 20 years ago if you slapped a triangle choke on someone they’d go, “Whoa whoa what’s he doing?” But now everyone watches MMA so they’re familiar with it. … Mixing the guns with jujitsu with the MMA is interesting to me now, it’s that close quarters combat (CQC) which is really interesting. Kinda makes you wonder about all the 80s and early 90s Delta Force style films. Maybe in 10 years America will have another wave of these. 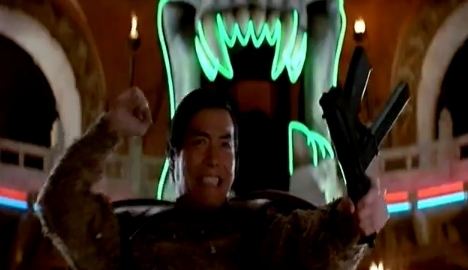 If you make martial art movies, you’ve run into this problem: how do I get to the fight scene when the guy’s got a gun? So you gotta develop some kind of ridiculous reason the gun disappears, breaks, unloads, or any number of excuses to take the scene in a fighting direction. I call it “The Jimmy” because oftentimes the reason doesn’t make a whole lot of sense, and you have to jimmy the situation for your scene to work. I say don’t worry about the Jimmy. If people are watching your film for the fighting, they’re expecting the gun to go away eventually. Kick it and add a sound effect of it sliding off. Or have Carter Wong break it. And if you have to keep guns in your film, you can always go the route of the ultimate Jimmy film, Equilibrium. Bob Anderson brought us much of American swordplay cinema. His credits include Highlander, The Princess Bride, Three Musketeers, Pirates, and more. He also doubled David Prowse as Darth Vader in The Empire Strikes Back and Return of the Jedi. Ever since the emergence of Errol Flynn, Hollywood has respected the blade. Swordfights are shot wider and with less cutting, and it’s obvious why. Our culture understands swordfighting (and only recently begun to understand martial arts), and with a man like Bob Anderson behind the action, it’s no wonder these scenes made such an impact. RIP Bob. Here are some of his best works in his memory.